It is absolutely necessary to work at a tension to produce 7½ stitches to the inch in width. Wind about ¾ oz of fawn wool round a piece of cardboard 8 ins. in length. Take off cardboard and keeping strands of wool in position, make head by tying securely about 1 in. from top, and make waist by tying 1½ ins from neck. Wind remainder of Fawn Wool round same piece of cardboard. Take off cardboard, tie both ends securely about ½ inch from each end. 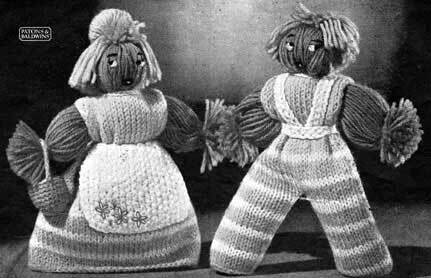 Sew arms in position through centre of doll between waist and neck. Wind Yellow Wool 80 times round a piece ·of cardboard 3 ins in length. Take off cardboard, tie securely about ½ inch from top, cut other end, sew in position on head and trim as illustrated. Using blue wool, cast on 75 stitches. ** 1st row: Knit plain. Repeat from ** to ** four times, then from ** to 4th row once. Cast off. Using blue wool, cast on 20 stitches. Repeat 1st and 2nd rows ten times. In next row: K6, cast off 8 sts, K6. In following row: P6, cast on 8 sts, P6. Using White Wool, cast on 21 stitches. 1st row: * K1, P1, repeat from * to last st, K1. Repeat 1st row twenty five times. last st, K1, turn, cast on 40 sts. 2nd row: Work in Moss Stitch to end of row, turn, cast on 40 sts. Work 2 rows in Moss Stitch. 2nd round: 2 dc into each tr. Repeat 3rd round four times. Make 21 ch, join to opposite side of basket. Fasten off. With a slightly damp cloth and warm iron, press clothes lightly. Sew bodice in position. Sew up seam of skirt and, using crochet hook, work 1 row of dc round lower edge. Gather top of skirt to fit waist, and sew in position. Embroider apron as illustrated and tie round waist. Make as given for Poppet but divide strands in half below waist for the legs, tie securely and cut. Using Blue Wool, cast on 10 stitches. Repeat from ** to ** once, then from ** to 4th row once. In next row: Using white wool, K15, turn. Continue on these 15 sts in plain, smooth fabric (stocking stitch) and stripes until six striped patterns have been worked from commencement. Repeat from ** to 4th row once. Cast off. Join in wool where sts were left, and work to correspond with other side. Work another piece in same manner. Using White Wool, cast on 3 stitches. 1st row: K1, P1, K1. Repeat 1st row forty five times. Cast off. Repeat 1st row thirty five times. Cast off. With a slightly damp cloth and warm iron, press clothes lightly. Sew shirt in position. Sew shoulder straps in position. Sew up seams of trousers and, using crochet hook, work 1 row of dc round lower edges. Gather top to fit waist, and sew in position. The original publication of this pattern is in the public domain, however, this digital version is copyright Sarah Bradberry 23rd May 2012. All rights reserved.